There are numerous FACTS that should in any reasonable person considering the Paris outrage, give rise to concern and the reliability of the official version of events. They relate to many 'coincidences' of repetition, timing and location. Absence of video or witness statements where they should be expected. Witness stories that don't accord with the circumstances or are simply unbelievable. Missing evidence from other sources. Physical evidence that does not accord with the alleged event. Impossible evidence that ties individuals to events. Very limited photographic or video evidence that appears either tampered with or not supportive of is supposed to have taken place. Evidence of crisis actors. Unbelievable Government statements. Inexplicable preparations contrasting to claimed lack of preparation or delayed response. Conflicting information on who, how or when some victims died that does not accord with the official version. So now let us examine some of these in greater detail. Perhaps I could refer you to and acknowledge, as I did in the first article, the contribution and inestimable value of Ole Dammegard's analysis here: Ole Dammegard: https://www.youtube.com/watch?v=bN89lVPkli0 Dammegard is a Swedish journalist who for many years has studied 'False Flag Operations' (FFO) following the assassination of the Swedish Prime Minister, Olof Palme in 1986. (See: https://en.wikipedia.org/wiki/Assassination_of_Olof_Palme and http://www.theguardian.com/world/2014/feb/27/olaf-palme-murder-inquiry-revoked-alibi-svenska-dagbladet-stieg-larsson ) He is not only convinced that this was not as the government portrayed it, but that similarly many other terrorist events around the world are in fact FFO designed to blame an opposition force and achieve government objectives either at home or abroad or both. Needless to say he has not received great support for his exhaustive and detailed research that supports his thesis. Indeed he gives the example of contacting over a thousand publishing outlets with details of it and not one responded! It powerfully supports the truthfulness of his contention that governments are not only deeply implicated in FFOs but are also desperate that the public should not know about them. We can only conclude that we are living through an age of deep and widespread deception, in which some of the most dramatic and influential events have been fraudulent. One of the things he points out is that time and again similar tactics are used, indeed we may say despite different events in different, it is almost as if a common team of organisers, using a common template, are at work. The events need to be shocking to have the desired psychological effect on the population. To do so they will usually target civilians and preferably young people and children. Death and injury are necessary constituents by bloody and merciless means. Horrifying accounts and/or images are required. Situations where maximum coverage and empathy can be ensured, such as thoroughfares, shopping centres, railway concourses, educational establishments or sporting venues. Sometimes other methods are used to spread terror such as posting letter bombs or containing infectious agents as happened following 9/11, indisputably traced to Government laboratories. It of course mirrors the more famous and effective lie of WMD that preceded the Iraq invasion, but nevertheless remains a potent psychological weapon by those that wish to induce fear. Sometimes the FFO targets only one person, which is blamed on others who might be quite innocent. The Kennedy assassination is the classic example of this. 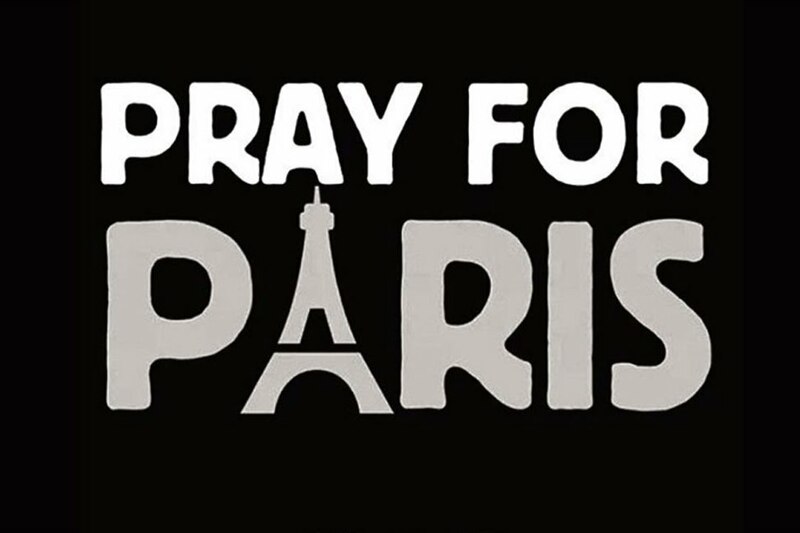 In the case of Paris there are some very ominous and familiar tell-tale signs. First they occurred on Friday the 13th a particularly poignant date for both the French (and Freemasonry) It gets its unlucky superstition from the event in 1307 when the French King, Philip IV in league with Pope Clement V moved against the Knights Templar, torturing and killing them amidst scurrilous (and probably untrue) charges prior to them being disbanded by edict of the Pope. (See: https://en.wikipedia.org/wiki/Knights_Templar) Of course this could be part of an ISIS plan but it appears to me to accord much more closely with a western mind. Then there is the timing on a Friday evening that just happens to catch prime European television times and even catches the later America market to maximise impact and it certainly worked with almost blanket coverage from Friday night extending into the weekend. It was also amazingly well timed for two sporting events that bound together the three principal European powers, France, Germany and the UK. Just at the critical time, about halfway through when it could be ensured everyone would be inside, two explosions occurred outside the Stade de France before a crowd of around 70,000 that created anxiety (wandering aimlessly on the pitch) and patriotism (note the crowd leaving the stadium singing La Marseillaise) both useful propaganda footage for the world-wide audience. It raises the important question why if these were indeed desperate suicide terrorists, they did not not set off their bombs a few minutes earlier, when they could have been assured of maximum carnage, or indeed knowing the President would be a 'sitting duck', they did not seize the opportunity to target him? To add to the efficacy of the occasion for propaganda purposes, the President of the Republic just happened to be present to be seen by all being ushered calmly out of his seat but remaining in full view in a glazed VIP area. When the explosions occurred he appeared to show no surprise or anxiety. Presidential Sang Froid or Pre-Knowledge? Maybe one might have expected him to at least turn about to look for information or reassurance but no he sits calmly until an aide arrived to whisper behind cupped hand in his ear, very apropos George Bush being informed of the Twin Tower attacks in identical manner. (The fact that we can now be certain 9/11 was a FFO adds a certain piquancy to the repeat methodology employed) Even when informed however (how did they know so fast?) he still shows no sign of surprise, shock or concern and remains in full view of the crowd and a potential target for anyone in it. Wouldn't it have been far more likely that at least a momentary facial expression or physical gesture would have occurred and perhaps even a brief conversation to establish the exact nature of the threat and of the need to evacuate, incidentally leaving everyone else uninformed in their place? Not even a remark to those next to him that he had to leave? Allowed by close protection to remain a potential target? 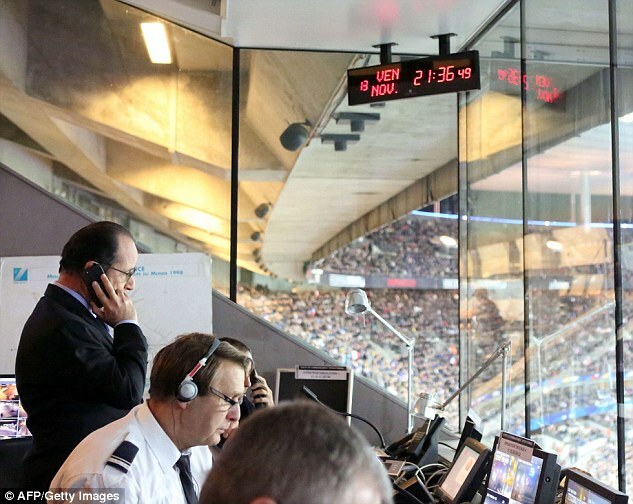 He remained in full view of the crowd inside the stadium taking calls. I have to say this shows a very relaxed approach to the President's security given the fact that at that stage they were not to know how many terrorists there were, where they were and whether Hollande might at any moment be targeted! Either it proves the security advice surrounding the President of France is quite impossibly incompetent - never in a month of Sundays would any security professional allowed him to remain in full view as an obvious target when no one could yet be sure if more terrorists were still around - or they were confident from the beginning there was no real threat. Perhaps it is worth pointing out at this point the common phenomenon in FFO of the subsequent 'clean-up' of the internet that takes place. I have highlighted the case of the video footage of him being informed has apparently disappeared but this is not the only case I have noticed. Similarly, video footage of the exit from the Bataclan has now strangely not only blurred bodies but this has been extended to the people being dragged to safety and significantly the unbelievable image and sound track from the alleged pregnant woman hanging from only one hand from the window ledge. Perhaps it has been considered that even in the catalogue of FFO impossibilities, this took the credible too far. I have also been unable to locate interviews of two men alleged to have witnessed the suicide bombers outside the stadium with incredible claims in the case of one that he was saved by his Samsung phone and in the case of the other was 'only ten metres away' yet was quite unharmed. Sadly because I can no longer find them I cannot post them but us at least let us not overlook the point that not only the implausible nature of the claims and evidence but also question why and how they have been wiped, presumably only by government agencies. Timing for maximum coverage and emotional impact? Very propitiously the following Wednesday another match between France and England had been arranged that went ahead under a sombre cloud in which some French players were said to be suffering from post traumatic stress. What better way to hammer home the 'shoulder to shoulder' slogan with our French brothers against the common enemy particularly to a largely working class football audience around the world. What a master stroke of planning. By Monday glossy full face pictures were available of many of the deceased in all the papers and media. For example in the following there is even a slide show of 50. (See: http://www.express.co.uk/news/world/619571/Paris-terror-attacks-moment-Francois-Hollande-told-city-under-attack ) We might ask how these were obtained so speedily from next of kin in only a couple of days. Was there even time to make reliable identification before seeking permission from next of kin. Then to obtain the image itself. To appear in Sunday and Monday Morning's. Not the Express web page is time dated '15.19 Sun 15th November, 2015'. In other words only forty two hours virtually ALL the victims, mostly young, attractive and smiling, were in print! This is quite incredible and must be regarded as suspicious at least until someone comes up with a rational explanation. Here's another overtly Christian symbol to hammer home the religious iconography and by implication, division between 'us' and the 'enemy'. All these versions plugging the same original theme had to be thought up, designs produced and circulating before the weekend was out! This replicates what we must call the advertising campaign 'We are all Charlie' although now it has a more explicit religious message, has more designs and two slogans (Paris and France) but a common 'pray for'. So if anything more thought and preparation has gone into it, it is slicker and more sophisticated. That however is the give away: slick means prior preparation and prior preparation can only be done by the instigators and planners, and no one I think would suggest it was the Jihadists who thought up “Pray for Paris”. This was only one of many public relations tricks. The tri colour appeared everywhere over the internet, Facebook and projected onto buildings. However a story goes that some of these appeared BEFORE the event but were quickly taken down. Many were the celebrity and sporting heros roped in to press home the tragedy. This is Justin Bieber actually putting the slogan into practice and praying in public at one of his concerts I assume. He considerately breaks down in tears before continuing with his act. https://www.youtube.com/watch?v=5ZFxxEVxqI0 Clearly all of this has to be coordinated and managed rather like a military operation by somebody, somewhere. We have the highly unusual meeting of the heads or ex-heads of British, French, American and Israeli secret services only a little over a week before 13/11. The chief of the CIA, John O Brennan, DGSE Chief Barnard Bajolet, former Director of MI6 John Sawyers and ex Mossad Chief Yaacov Amidror all met with other Intelligence big wigs met at the The Shared 21st Century Mission Conference at the George Washington University on the 27th October, 2015. Given the events on the 13/11, the timing is amazing percipient, yet apparently everyone was taken by surprise by it. Hard to believe don't you think? Israeli Hospital Attack day before. We need not be reminded that the motto of the Mossad organisation is 'By way of deception, thou shalt do war.' The reason this incident is embarrassing to Israel is that it has been caught in the act by cameras not under their control, proving that it is quite capable of carrying out a killing operation, even in the context of an hospital, contrary to international rules of engagement, pretending to be persons other than what they are. The men in these units are clearly not limited by any ethical considerations, are highly trained in the use of physical force and weaponry, will kill without compunction even when not in physical danger themselves, and are fluent in Arabic, so that the shouting of Allah Akbar and such slogans would present not the slightest challenge. You can probably see where I am going with this. Both in the Charlie Hebdo and Paris 13/11 incidents, serious reservations have been raised regarding the persons who carried out some or all of the shooting. Whilst it is true that nothing has connected Israeli operatives to them, it is equally apparent that Israel has proved beyond doubt it is prepared to use deceit wherever and when ever it thinks it in its interests and has a body of men highly trained in all the required characteristics. We should bear this in mind when we see in video shooters, or have witness descriptions that do not appear to fit any of the alleged perpetrators. Moving on to Paris itself we have the rather interesting fact that the Bataclan Nightclub, owned by the same Jewish family for no less than forty years just happened to be sold just weeks before the attack. The Times of Israel (even!) reports that Pascal Laloux the previous owner was, “Devastated because we knew everyone who worked there.” His brother even relates that he took a call whilst the attack was taking place and he could hear the gunfire. New Bataclan owner ISIS connections? The Bataclan was apparently purchased by Qatar’s media Lagardère conglomerate, that controls Al Jazeerra Media Network, ultimately owned by Sheikh Tamim bin Hamad Al Thani. This information we are told was not easily unearthed. (See: http://www.waronwethepeople.com/qatar-owned-bataclan-theatre-sale-on-911-exposes-paris-attacks-conspiracy/#sthash.LVOG7Wb9.dpuf ) The suggestion has been that the premises was attacked for anti-simitic reasons, except of course the Bataclan was no longer Jewish owned and it would largely be filled with non- Jewish French nationals. Nor should it be overlooked that Qatar is a major funder of ISIS at the West's behest. So just as ISIS has been the West's avatar for its duplicitous activities in the Middle East, so it might have been in Paris, again to throw the blame in the ISIS direction. Perhaps it is also worth noting that the new owner of the Bataclan, Tamim bin Hamad Al Thani also owns huge chunks of the British economy including Harrods and defence industries that I have elsewhere described have benefitted enormously from the decision to attack Syria.I apologise for the apparent fog, but in such matters it is unavoidable I am afraid. Let us be content with just this, that after forty years the Jewish owners, just before a calamity that would likely ruin their prospects of selling, very fortuitously sell up to wealthy buyers, cashing in and relocating to Israel. It has clear parallels with the well documented instances of 9/11 in which Jewish employees were luckily advised to stay away from work and the Jewish owner of the buildings was not ruined by the event but profited by it, to the tune of about 7 billion dollars, paid for out of American insurance premiums! Before we leave the topic of general matters of timing, we should note how amazingly useful the event turned out to be in getting huge political and public support for already agreed objectives, namely an extension of marshall law with a suspension of Constitutional protections for the public, and a ramp up to military operations in Syria. You will note that the carrier and planes and weaponry were already in place, rather akin to the British that started bombing sorties within the hour of the Commons vote. These facts do not denote surprise but expectation.